Forget everything you thought you knew about Goulash. 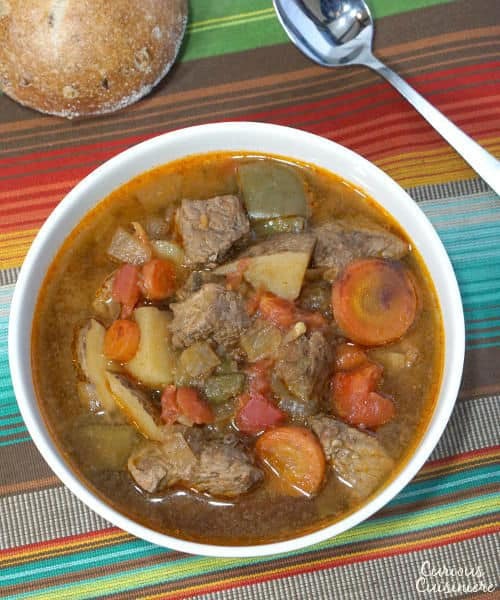 Traditional Hungarian Goulash is a chunky soup full of tender beef, hearty vegetables, and lots of flavorful paprika. 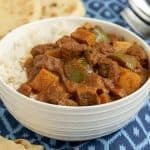 Our Slow Cooker Hungarian Goulash recipe makes this comforting and healthy dinner incredibly easy to prepare! To most Americans, when we say goulash you wouldn’t think of the healthy and hearty soup we have pictured here. American goulash is an easy, one-pot meal (referred to in parts of the country as American Chop Suey) that contains ground beef, macaroni noodles, tomatoes and cheese. We’re not sure how it gained the name of the wonderfully chunky and hearty Hungarian soup, but (although tasty and comforting) it has come a long way from its namesake. The soup has evolved over time, gaining ingredients like tomatoes and paprika, which were unknown to the original Hungarian gulyas. But, the hearty, nourishing nature of the base of the soup has stayed the same. It can get confusing standing there in the spice aisle staring at the types of paprika. Hungaring Sweet. Hungarian Hot. Spanish Sweet. Spanish Hot. And then there’s just Paprika. Paprika is a spice made from a type of chili pepper that has been dried. The peppers can be mild or hot depending on where they are grown and what parts of the pepper are dried. Spanish paprika is dried by smoking, giving it a bit of a smoky flavor. Spanish paprika can be found mild, medium, and hot and typically has a more subtle flavor than the Hungarian variety. For Hungarian paprika, the chilies are sun-dried. It is characterized by its bright color and a rich, robust flavor. You can find it in six levels from sweet to hot. If your paprika is simply labeled “Paprika,” it could really come from anywhere. It shouldn’t be sweet or hot, and it may have other dried chilies mixed in. It most likely won’t have the intense color of Hungarian paprika. For this dish, we would recommend picking up some Hungarian Sweet Paprika just to get an idea of the real flavor that paprika can have and the robustness it can add to a dish. We’ve taken the traditional long-simmering Hungarian goulash and made it even easier by breaking out the slow cooker. 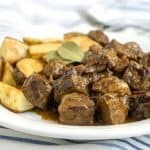 With a little prep work early in the day or even the night before, slow cooker Hungarian goulash is a hearty and nutritious meal takes care of itself. The longer you cook it, the more tender the beef becomes. So, even if you’re a bit late getting home, the soup will still be ready to greet you with warm, comforting arms. 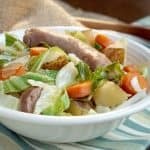 With all the veggies and beefy protein in the soup, you are on your way to an incredibly balanced meal. The only thing you’re missing is the whole grains. But, that’s easy to fix. 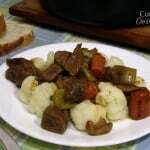 We like to serve our slow cooker Hungarian Goulash recipe with hearty and rustic whole grain bread or rolls. (The crustier the better!) The whole grain goodness is perfect for soaking up the broth! Heat a large saute pan over medium high heat. Sprinkle salt and pepper over the beef cubes and place them in the hot pan. (Do this in batches if necessary so the cubes are not crowded.) Sear the beef cubes on all sides, 1-2 minutes per side. Remove the meat from the pan and place it in a large, 3-4 quart slow cooker. Melt ½ tsp of butter in the, now empty, pan. Add onions and garlic. Sauté over medium heat until golden, 7-10 minutes. Transfer the onion mixture to the slow cooker. Melt the remaining ½ tsp butter in the pan. Add the carrots, bell peppers, and potato. Sauté over medium heat, 7-10 min. Add the Hungarian paprika and caraway seeds. Mix well. Transfer the mixture to the slow cooker. Put 1 c of water into the hot pan to deglaze the pan. Scrape up any stuck bits and seasonings from the pan, and then pour the liquid into the slow cooker. Add the bay leaf to the slow cooker along with enough water to just barely cover the meat. Cover and cook on low for 6-8 hours (or high for 4 hours). -30 minutes before serving the soup, add the diced tomatoes. Mix the soup well. Taste it and add salt as desired, to taste. If the soup is too brothy for your liking, continue to cook with the lid off until the desired thickness has been reached. Serve the soup with crusty, whole grain bread. Hi,finally it’s not a stew.? 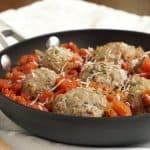 Good recipe,thanks you for sharing a good one. I just want to dive into that bowl it looks soooo good! 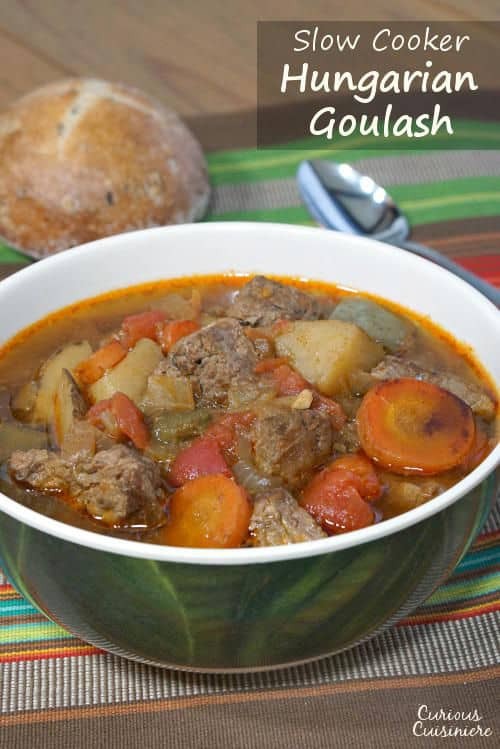 You know you had me at Goulash. One of my all-time favorite stews. Oh yes! It has become a go to comfort food over here! This looks PERFECT for dinner. 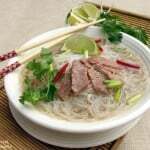 It’s so cold and there’s so much snow that I need a big bowl of warm like this. This will warm you up quick. That’s for sure! I’ll take the authentic goulash over the American version anyday! 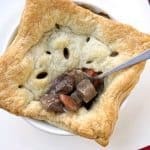 Such a perfect stew for snowy weather! This looks like a warm and inviting meal. Love that it’s in the slow cooker! Thanks! It’s so nice to come home to such a comforting meal! I don’t care what you call it, I want the biggest bowlful around! 😉 Thanks for a killer recipe! 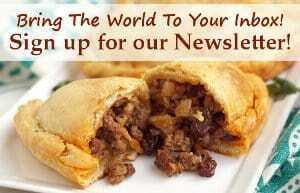 I am with you – healthy does not mean it has to be under-seasoned or bland. 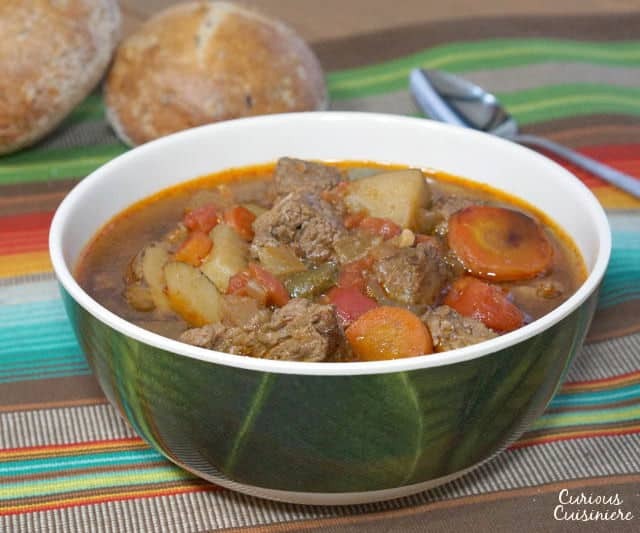 This Hungarian Goulash looks perfect for this time of year! Sounds like a visit to the spice store is in order! 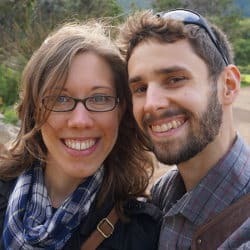 Great post and I learned something new! 🙂 I did grow up eating the “American Chop Suey” with macaroni. 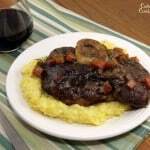 This recipe looks delicious and I think the pairing with the roll is perfect! Thanks Shelby. We did too. The American version is quite the comfort food dish too!